Thriving Cat > Behavior Problems > Is your cat peeing outside the box? I stumbled on some solutions! Anxiety and stress over my cat peeing outside the box, then finally a solution. My third cat started out extremely shy and timid. He hid under the bed, was scared of everything and even after he warmed up to me he was still scared and jumpy around my husband. When he finally came around and moved about the house he started acting annoyed at the world and peeing on things. He peed on carpets, he peed on clothes, he peed on my favorite shoes. He peed on papers and his personal favorite, bath mats. We took him to the vet who found nothing wrong. We tried so many different things and none had much success. I lived in terror of hearing the scratch, scratch, scratch that meant he had just peed on something and was “burying it”. So, when I found solutions to actually fix it I wanted to share it with the world of cat parents out there who are at their wit’s end. Why is your cat peeing outside the box and what can you do about it? This is one of the most stressful behavioral problems for cat owners. While often a behavior issue that can be fixed, peeing outside the box can be due to a health problem, so please get your cat checked at the veterinarian as it could be due to a urinary tract infection, diabetes, or other serious condition. If you want to check to make sure your cat’s urine is normal and there are no indications of a health problem, try this amazingly simple and affordable home check with a litter additive that changes color to indicate changes in pH. I use this periodically just to make sure everything is normal for my three cats. Just sprinkle it on top of the litter. If it changes color to indicate urine pH is too low or too high, make an appointment with your vet. Here is my review of this great product: Cat UTI Home Test. Next, you have to make sure you have enough cat boxes, they are big enough, they have good litter and they are kept clean. If all that is ok and your cat checks out and is healthy your vet may suggest an anti-anxiety medication. These prescription medications can taste horrible (I tasted a bit of the liquid prescribed for my cat), can be very expensive as they may need to be made at a compounding pharmacy if it is a liquid and can be very difficult to administer. Cats often don’t like them at all further adding to the trauma of the whole experience. If the cat is stressed out he may still pee on things anyway! So, is there a better, more effective alternative? Yes! First of all what is causing the Anxiety? Your cat may be peeing outside the box due to stress caused by changes in the home. This could be adding a new cat or dog, losing a pet, moving or having a new baby. It could be due to territoriality as a neighbor cat outside could be spraying right outside your door. If your cat sees another cat doing this and smells it, your cat may respond in kind. He is trying to tell the world, “This is my home, not yours”. “Go away”. There are many possible reasons for a cat to feel anxiety that causes bad behaviors. If your cat is a rescue, there may be no way to ever know his background. He may have experienced trauma that will affect his ability to feel safe in his new home. You need a solution. You don’t want to give up your cat but you can’t deal with the constant fear that he is peeing on the carpet, peeing on your clothes, peeing on the bathmat, peeing on everything. What SOLUTIONS are there for a cat peeing outside the box? You can finally breath a massive sigh of relief! There are easy solutions for this problem behavior. First of all there are several lines of pharamone mimicking products that use scent to make your cat feel safe and content. When they feel safe and content, they usually won’t pee outside the box. Diffusers can have a calming effect on all the cats in your house at the same time, the more cats you have, the more cost effective this may be if you have multiple cats with anxiety. Diffusers do help the situation and at first I thought they were great as my cat stopped peeing everywhere. Some of them even smell good to humans like the lavender scented ones. They are only recommended to work in one room, so if you have a large house you could need a lot of diffusers. If you need many diffusers throughout the house, this could get expensive. The diffusers only last about a month so you need to stay on top of which ones are running low and change them quickly. As soon as they run out the cat may start peeing on things again. Some people say this happens even when they are low on liquid before it runs out. Diffusers may on rare occasions (I have seen it happen myself) overheat and smoke! This could be a fire danger! Finally, though they work great at the beginning, in my experience they aren’t enough and after a few months they just don’t seem to work as well. The peeing may start again if there aren’t enough diffusers throughout the house. Note: I never had a diffuser in every room. If I did, they probably would have been sufficient but this was just way too expensive. My top recommendation is a tie between two products. I use them both simultaneously for my problem cat and he is now a dream. He is sweet, happy, content and doesn’t pee anywhere outside the box! The same brands that make the plug-in diffusers, also make disposable collars for cats that serve the same purpose. However, all the negatives about the diffusers are no longer a problem if you use the collar. You only need a single collar on your cat. It goes everywhere with him so no need for multiple products throughout the house. This also means the collar is significantly cheaper than using the diffusers as a collar costs less than one diffuser and you would likely need at least three diffusers in your home assuming it is small. There is no fire danger here. Just a simple collar….however, there is a danger of the collar getting stuck in the cat’s mouth if it is too loose. If the cat tries to get it off, he may get his lower jaw under it then get it stuck in his mouth. This happened to my cat when I first got the collars! If he struggles to get it off it could cut his mouth and make it bleed. Make sure the collar is snug but not too tight. You should still be able to fit several of your fingers under it if it is a full size adult cat. Additional pros of the collar include the fact that you only have to keep track of one collar, not multiple diffusers so it is easier to swap it out on time and best of all, it seems to be more effective! One downside is that my cat runs when it is time to change the collar. He seems perfectly content when it is on, he doesn’t scratch at it and it doesn’t seem to bother him in the slightest. When I take the old one off to replace it however, he hides and makes it difficult to catch him to put the new one on. 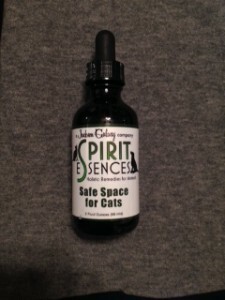 Spirit Essences brand Safe Space for Cats drops. This is Jackson Galaxy’s line of pet products. The drops are applied to the cat’s fur. You put the drops in your hand, then rub it on the cat’s fur on his head, neck, chest or shoulders. The drops have very little smell (much more mild than the collar or diffuser so they might work better for someone sensitive to scent). They don’t seem like they would do anything. It looks like just a few drops of water so it is hard to believe this will fix such an entrenched problem behavior. It works like magic! My cat has not peed outside the box since I started using these drops in conjunction with the pharamone collar. This has been about 6 months of success! There are yet more products out there that may work for your cat including over the counter liquid that gets mixed in food that doesn’t taste as bad as the prescription medicine. These products worked somewhat for my cat, but the pharamone collar and Safe Space for Cats drops are the ones that are the most easy and effective for us. If you have a problem with a cat peeing outside the box, or have found other solutions, please leave a comment and share below! Jessica at Thrivingcat.com is a participant in the Amazon Services LLC Associates Program, an affiliate advertising program designed to provide a means for sites to earn advertising fees by advertising and linking to amazon.com. wow! Great article! This can be a real issue for cat owners. Now, we need to find a way to get the old pee scent out of the carpet! It’s horrible and never seems to goes away completely. Thanks, too, for offering a couple options, here; not all cats are keen on wearing a collar so good to know the diffusers are available even though they may be a bit more costly. Yes, luckily the cat who hates collars isn’t the one who needs anxiety assistance! I will address pee smell removal in a later post. This is a great article! Thankfully I don’t have this problem with any of my cats, but I know of some ideas now if they do. This is cram packed full of information! Thank you. Thanks Rae Anne! I will have posts on many other topics like tooth and gum supplements, energy and metabolism supplements, upper respiratory infection prevention and more. Stay tuned. I love your site. This is good information. My cats don’t pee outside their liter box but I have one that occassionally poos outside their box. I have another one whose hair is falling out and I’m afraid it might be stress. I wonder if some of these diffusers would help him. Also, one of my cats hates the newest one, maybe the diffusers would calm her too. Nice to see you here! Yes, I think they would help. There is a separate pharamone diffuser (that I have not used yet) by Feliway brand called “MultiCat”. 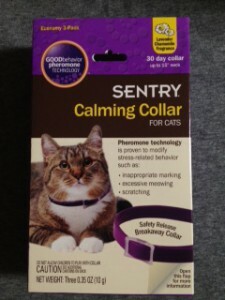 It is supposed to reduce tension in multi cat households…yay! We could all use that sometimes. They say the original diffuser helps somewhat with multi cat situations because it makes the individual cats feel calmer but the new MultiCat diffuser is specifically formulated to help with the social dynamic and make them get along better. Worth a try I guess! I will be adding affiliate links soon for these products through Amazon. I will let you know. If you try a product such as the MultiCat, please let me know. I would love to add other’s reviews as well as my own. The more cat people we get on here the solutions we can find and the more cats and their people can have a happy home! And our cat that peed outside the box, pooed outside the box occasionally too. He doesn’t do that anymore since I started using the pheromones and the drops. I have a question. My cat, Cali, does not pee outside of her litter box. She does however, drag socks and things into her litter box to cover up her business. Do you think the box is too small? She is an odd ball, I have never heard of a cat doing such a thing! Do you have any idea why she does this and how I can prevent her from ransacking all of my socks? I have seen my cats drag a sock to cover an area where they had an accident or threw up on the floor. I guess it is part of the natural instinct to cover their mess. I don’t know if it would solve the problem, but it wouldn’t hurt to get a bigger box and or an additional box. Do you just have one cat? If you have multiple cats it is important to have an extra box. Also make sure you have plenty of clean litter in it at all times. Thank you. I think this is important information for cat owners to know because problems with peeing around the house can be extremely stressful. Owners often feel overwhelmed and don’t know what to do. I felt that way myself. I want people to know there are solutions for these issues.